Use the browse option for viewing items in a collection without specifying search criteria. Change the way you view collections while browsing by selecting Preferences. If column headings are hyperlinked, they can be used to sort results. An arrow indicates the direction of the sort for that field. To view a different collection, select a collection from the drop-down list and click Go. Each letter below corresponds to a definition of that element. Global navigation for searching, browsing, and working with items in collections. Select a collection to browse and click Go. Displays the number of items you are browsing in the collection, as well as how many display on the current page. Use these links to add items to My Favorites. Select All activates all the check boxes on the current page. Clear All removes all checks from the check boxes. To add items to CONTENTdm My Favorites, check the boxes next to the items you want (or click Select All to check all items on the page) and then click Add to Favorites. See My Favorites for more information. If the collection contains more items than can be displayed on a single page, click the hyperlinked page numbers to view other pages. If the collection contains more items than can be displayed on a single page, click Next or Previous to view other pages. Click a hyperlinked title heading to sort. An arrow indicates sort order. You have several options for searching within a single collection or across multiple collections. You can quickly search for items by using the general search box, or click Advanced Search to use other types of searches. The search box (in the heading of the page) searches across all fields in all collections for any term that you put in the search box, in any order. For example, if you search for "westward migration", the search engine searches for items containing "westward", or "migration". Both the search box and Advanced Search support the use of a wildcard operator that enables you to search for approximate terms. Using an asterisk (*) at the end of a search term will search for results with none, or any number of any characters appended to the root search term. For example, test* will find results with the words "test," "tests," "tested" and so on. The Advanced Search page enables you to select specific collections to search. First determine which search to use (across all fields, by selected fields, by proximity, or by date [by date may not always be available]). The default selection is to search across all fields. Then choose from the available search types and specify the collections to search. The search options presented differ based on your initial choice to search across all fields, by selected fields, by proximity or by date. The default selection is to search across all fields. When you select Search Across All Fields, a screen similar to the one below appears. Each letter below corresponds to a definition of that element. Click an option to specify your search preference. Search across all fields, selected fields, by proximity, or, if available, by date within collections. Whether you have access to the date range search depends on the content of the collection, so this option may not be available. The default mode searches across all fields. Choose to search for all of the words, the exact phrase, any of the words, none of the words, or a combination. Type your search terms in the appropriate text boxes. Click Search when you have finished specifying your search criteria. Click Clear all to reset all the search fields. Depending on the number of available collections, you'll see either a check box or list box option for selecting collections. Check boxes — Choose which collections to search by clicking check boxes next to collection names. To remove a collection from your search, uncheck the box. List boxes — Select a collection name and click Add. Collections will appear in the Selected collection list box. To select multiple collections from a list box, press Ctrl from your keyboard while selecting collection names. To select a block of collections, select the first collection and then press Shift while clicking the last item in the block. Click Add or Remove. Select all collections. Click select all to search across all collections. Clear all collections. In order to perform a search, you must have at least one collection selected. When you select Search Selected Fields, a screen similar to the one below appears. Each letter below corresponds to a definition of that element. Use the drop-down list to choose from the types of queries available. You may choose to search for all of the words, the exact phrase, any of the words, none of the words, or a combination. The Show Terms link is available only when searching a single collection. Click Show Terms to open a list of indexed words that appear in the field you selected from the Field Names drop-down list. Click a word in the index list to automatically place the word in the search text box. Click Search. Add more search fields by clicking More Fields. Reduce the number of search fields by clicking Fewer Fields. You can have as many as four fields and as few as one field. When you select Search by Proximity, a screen similar to the one below appears. Each letter below corresponds to a definition of that element. Type your search term in the text box. Use the drop-down list to choose the number of words the search term in the first search text box can be from the search term in the second search text box. Use the drop-down list to specify which field you want to search. Whether you have access to the date search depends on the content of the collection, so this option may not be available. Only the collections that are searchable by date can be selected and searched in this mode. When you select Search by Date, a screen similar to the one below appears. Each letter below corresponds to a definition of that element. Use the drop-down list to refine your search by selecting phrasing options so that your results match. Type your search terms in the text box. Use the drop-down list to specify a date range, or to search after, before, or on a particular date. Use the drop-down lists and the text box to specify the range of dates you want to use in your search. Entering a year is required to perform a search. The required format for year is yyyy. Although not required, selecting more options will narrow your search. Only the collections that are searchable by date are available in the by date search mode. Depending on the number of available collections, you'll see either a check box or list box option for selecting collections. Check boxes — Choose which collections to search by clicking check boxes next to collection names. To remove a collection from your search, uncheck the box. Only the collections that are searchable by date can be selected from the list of available collections. List boxes — Select a collection name and click Add. Collections will appear in the Selected collection list box. To select multiple collections from a list box, press Ctrl from your keyboard while selecting collection names. To select a block of collections, select the first collection and then press Shift while clicking the last item in the block. Click Add or Remove. Only the collections that are searchable by date will be included in the list of available collections. Results may be viewed in a variety of ways and can be changed using Preferences. To view an item within the search results, click on a thumbnail image or the hyperlinked text describing the item. Returns to the Advanced Search page and retains collection and preference settings from the previous search. Provides a list of matches organized by common metadata. Click an option to further narrow the results within your original search. Refine Your Search options may display for some collections and in some results views only. Displays the number of items in the collection(s) that match your search criteria, as well as how many display on the current page. If your search produces more results than can be displayed on a single page, click the hyperlinked page numbers to view other pages. If your search produces more results than can be displayed on a single page, click Next or Previous to view other results pages. When column titles are hyperlinked, they can be used to sort your results. An arrow indicates the direction of the sort for that field. Use the check boxes to add selected items to My Favorites within CONTENTdm then click one of the links at the top and bottom of your search results to add or clear the selected items. JPEG, JPEG2000, PNG and GIF files open in a window similar to the one shown below. 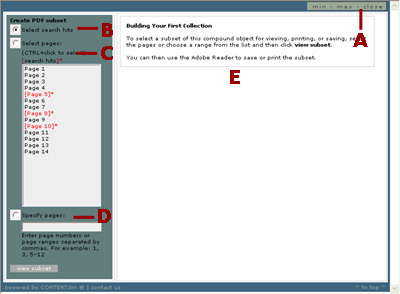 Portable Document Format (PDF) files open in a window that uses Adobe® Reader®, if inline viewing has been enabled by the creators of the collection. For more information, see Viewing PDF Files. Click Back to Results to return to the results page. Add the item to My Favorites. Use these operations to navigate the image. See Image Toolbar for more information. Click Previous or Next to go to the next item in your results page. Click Reference URL to access a window that contains the URL of the item being viewed. Copy the URL within the text box and paste it into citations and other references. View descriptive information about the item. Depending on how the collection is configured, clicking on a hyperlinked word will launch a new search for that word within the collection where the item resides, across all collections, within the current field, or across all fields. If the item cannot be shown in the item viewer, click a hyperlink to view the item, as shown below. Click this link to view a file that cannot be displayed in the item or compound object viewers. Zoom, pan, rotate, hide/show thumbnail, and clip options may be available when viewing images in some collections. Click the magnifying glasses to magnify or reduce the view. The zoom percentage is displayed in the text box. Click the arrows to move left, right, up, or down within an image. Click the page icons to view an image at 100 percent, view the entire image, or view the image within the page width. Click the rotate icons to rotate an image 90 degrees clockwise or counterclockwise. Click the hide/show thumbnail icon to hide and show the small image used to navigate the larger image. The navigation thumbnail setting you select will be retained throughout your session when viewing single items. Click the clip icon to open the clip viewer window that allows you to select a segment of the image to save, e-mail, or print. The selected segment may resize when displayed in the new window. When the toolbar is visible you can click within the image to zoom in and center the view. Adobe Reader displays PDF files alongside descriptive information within CONTENTdm. Click Open PDF in new window to display the PDF file in a separate window. Click Go to PDF description to jump to descriptive information about the PDF file. Depending on how the collection is configured, clicking a hyperlinked word launches a new search for that word within the collection where the item resides, across all collections, within the current field, or across all fields. Documents or multi-sided objects are displayed in viewers that provide additional navigation appropriate to the item being viewed. Objects in Portable Document Format (PDF) are displayed in a viewer that uses Adobe Reader. Click Menu Off to hide the menu on the left side of the screen. When the menu is hidden, click the previous/next page links to view other pages. To show the menu, click Menu On. Add the complete document or item to My Favorites. Add only the current page or side to My Favorites. Click Previous or Next to go to the next item in your results page. Your zoom and navigation thumbnail settings will not be retained when you go to the previous or next item. If full text searching has been enabled by the creators of the collection, you can search for words within an object. Type search words in the text box and click Search. Red brackets and an asterisk appear next to each page or side within the object that contains the word you searched for. View the number of results found after a full text search. Then, use Previous Hit and Next Hit to navigate between the full text search results. Use these operations to navigate the image. For an overview, see Image Toolbar. In some collections, documents and newspapers may have additional data that allow you to highlight and view individual articles. In these collections you may move your mouse over an article and see it highlighted. Clicking on the highlighted article will display the entire article in a separate window. You can use the Hide/Show Article option to turn on and off article highlighting. Click on the Hide/Show Article icon on the image toolbar to activate article highlighting. Mouse over the article you wish to view and click on the article you have highlighted. Document Description/Item Description — View descriptive information about the complete document or item. Page Description/Side Description — View descriptive information about a single page or view of a compound object. Page & Text — If a transcription of the page is available, view the image and a transcript of the page, side by side. Side by Side — View both sides of a two-sided object at once. Subset of Print Version — Select a subset of the complete document for viewing, saving, or printing. This option may be available for some items only. Complete Print Version — View a PDF of the entire document or item for printing. This option may be available for some items only. Go to the previous or next page within the document or item. Any thumbnail, zoom, or article view settings you have selected will be retained when you move between pages. These settings will not be retained if you go to the previous/next result, turn the menu on/off, or turn on the article view. Use the links in this section to navigate to specific pages or sides within the document or item. Click Reference URL to access a window that contains the URL of the compound object being viewed. Copy the URL within the text box and paste it into citations and other references. The Subset Viewer opens in a new window and enables you to choose pages of a compound object for viewing, saving, or printing in Adobe Reader. The Subset Viewer may be available for some items only. Minimize, maximize, or close the Subset Viewer window. Select a subset of the compound object pages that includes all pages with matches to a search performed in the compound object viewer. Click View Subset to view the PDF subset. This option only displays if a search in the compound object viewer returned results. Select one or more pages of the compound object. Click View Subset to view the PDF subset in the viewing pane. Enter page numbers or page ranges separated by commas. For example: 1, 3, 5-12. Then click View Subset to view the PDF subset in the viewing pane. View the PDF subset after making selections. Use the drop-down lists to change the appearance and sorting of the search results and My Favorites pages. Changing settings in the My Favorites section also affect Slideshow and Compare. How the results are viewed. How the results are sorted. How many results are displayed per page. The background color and the link colors. How many columns are displayed. Whether to delete My Favorites and cookies. Use the drop-down list to choose how your results are displayed. Grid — Displays up to five fields or four fields and a thumbnail image. Thumbnails — Displays a thumbnail image and the item title. Bibliographic — Displays text from up to five fields without images. Titles — Displays only item titles. Hierarchical — Displays search results sorted in groupings. The fields that you select to sort by in preferences are the fields that are shown in this results view. Use the drop-down lists to determine the sort order for your search results. Search results are displayed in sort order even if the fields you choose to sort by are not visible in the results view. Relevancy sorting is available for sorting search results only and does not apply when browsing a collection. Relevancy sorts the results according to their relevance to your specified search. When sorting by relevancy, sorting by fields does not apply. Choose the number of results to view per page. The results options vary, depending on the type of view that is selected. Click the check box to delete your stored preferences and to restore the default settings. This deletes the preferences cookie. The Restore Defaults button does not delete the preferences cookie. See Removing Favorites and Cookies below for more information. Click Restore Defaults to restore defaults. This does not delete the preferences cookie. The default view is grid, sorted by title, with 20 results displayed per page. Click Apply Changes after changing the view options, sort order, results per page, and/or restoring defaults. Click any of the colors to change the background color and its corresponding text color and link color for My Favorites, Slideshow, and Compare. Choose the number of columns to display in My Favorites. If you choose a larger number, you may need to scroll horizontally to see all items. Click the check box to delete your cookie and remove all items in My Favorites. See Removing Favorites and Cookies below for more information. Click Restore Defaults to restore defaults for My Favorites, Slideshow, and Compare. The default background color is white with black text and blue links and 3 columns per page. Click Apply Changes after changing the color or columns per page, removing favorites, or restoring defaults. If My Favorites does not load as expected, it may be a problem with your Web browser cookie. You can delete your cookies through your Web browser or you can easily delete the My Favorites cookie by selecting the check box in My Favorites preferences. Selecting the check box deletes all items saved in My Favorites. If you want to delete changes you have made to the way your preferences are displayed, select the check box in My Results preferences and click Apply changes. This will delete the cookie that stores your settings. Selecting Restore Defaults, on the other hand, will update your cookie with the original default settings which will override any custom settings created by the collection owner. Using My Favorites requires cookies. If your Web browser settings do not allow cookies to be saved on your computer, you will not be able to use My Favorites without changing your Web browser's settings. Any media file within CONTENTdm can be added to your CONTENTdm Favorites for viewing, e-mailing, saving to your local machine, or posting to Web sites. When you view collections in CONTENTdm, click My Favorites to review or edit your personal favorites. Items can be added to My Favorites when you search or browse a CONTENTdm collection. The option to add an item to your Favorites is available any time you view an item or its description. Click Add to Favorites. The item and the item description are added to My Favorites. When viewing compound objects, add single pages or add the entire compound object to My Favorites. From the left toolbar of the My Favorites page, click Slideshow. The slideshow viewer opens. Click Next or Previous to move through the images in your slideshow. To view the item metadata, click Metadata. To compare two images side by side, click Compare. To jump to a specific item, use the drop-down list. Close the slideshow viewer to return to My Favorites. Use the drop-down lists in the Compare section to specify items you want to compare. Click Compare. The comparison window opens. From the Remove drop-down list, select the number of the image you wish to remove. To remove multiple items, use your mouse to select items from the drop-down list while pressing the Ctrl key until all desired items have been selected. To remove all items from My Favorites select All from the bottom of the drop-down list. Click Remove. A confirmation message appears. Click OK. This action removes the image from My Favorites but does not remove any images from collections. From the first drop-down list, select the number that corresponds to the image you wish to move. In the second drop-down list, select the number of the new position where you want to move the image. In the Save As Web Page section of the My Favorites page, type a name for your Favorites in the text box. If you do not enter a name the file will be saved with the default name "My Favorites". Click Create. A new Web page opens. In the Save Web Page dialog box, confirm the name of the Web page you are creating and then choose Web Page, HTML only as the file type. Select a location to save the file. Open the published Web page. Click the Make Favorites button located at the top of the published page. Any existing items saved in My Favorites will be overwritten and replaced with the current page.